Medallion Variation Quilt: 52" x 76"
I'm back with some more of that awesome Mimosa Collection. This time I cut out a bazillion melons using my Double Wedding Ring tool (OK, not a bazillion, but it seems like it when you are cutting them one by one). What am I going to do with them? Well, I have an idea that has to do with an Orange Peel block. 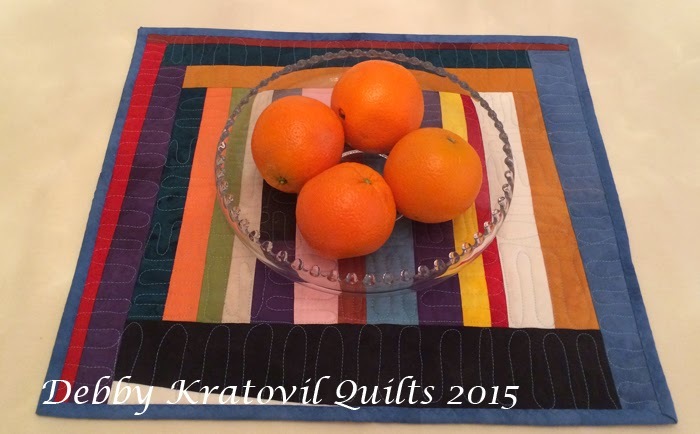 I have used that center melon for a LOT of quick quilt projects. You can see below how I use fusible webbing on the wrong side of the fabric and trace around the simple shape. 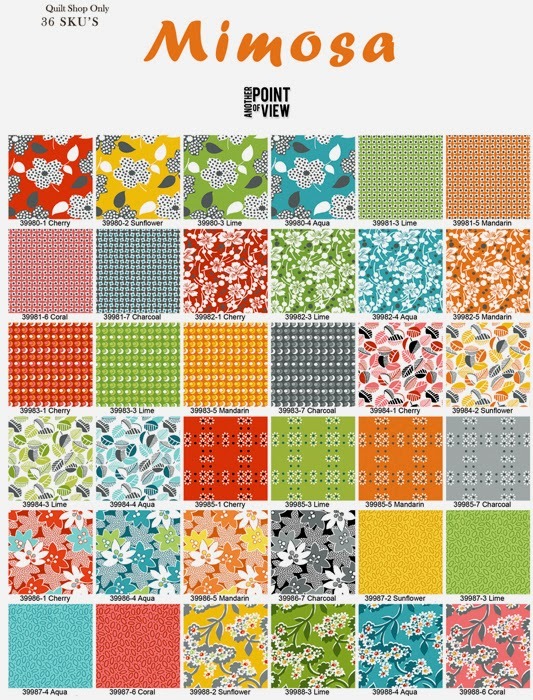 And do you remember Flower Power from the 60's Blog Hop last year? Yes, I do sell this pattern set. No, you can't find it on my web site. 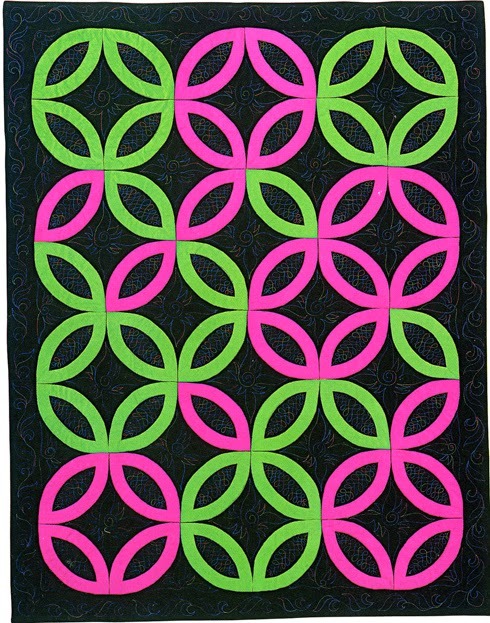 It has both acrylic templates, patterns for both green and black projects, the pink and green runner and ideas for arranging these awesome shapes into other variations. $15, plus $2 postage USA addresses; international, contact me first. I take orders via PayPal. Now, if you want to be entered into the Gee's Bend pattern giveaway, just leave a comment below. Contest is over tonight at midnight and I will contact the winner some time tomorrow. If I don't hear back by Friday, I will choose another person. If you're a no-reply comment, I have no way to contact you (sigh). The giveaway is NOT the template set. There is some misunderstanding about this, which tells me people aren't reading my WORDS. 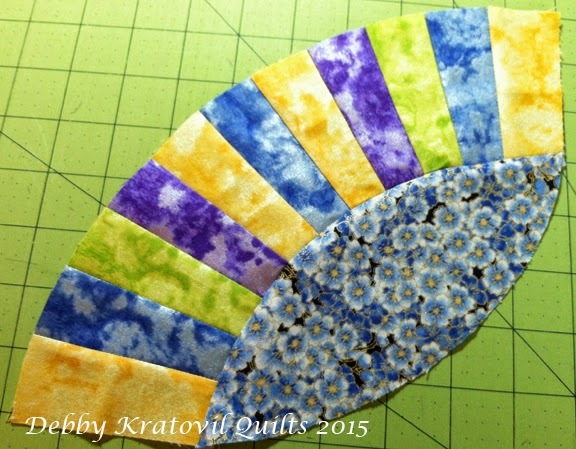 I will have a giveaway of the DWR template set sometime in the future, but TODAY'S giveaway is a GEE'S BEND PATTERN. Got it? 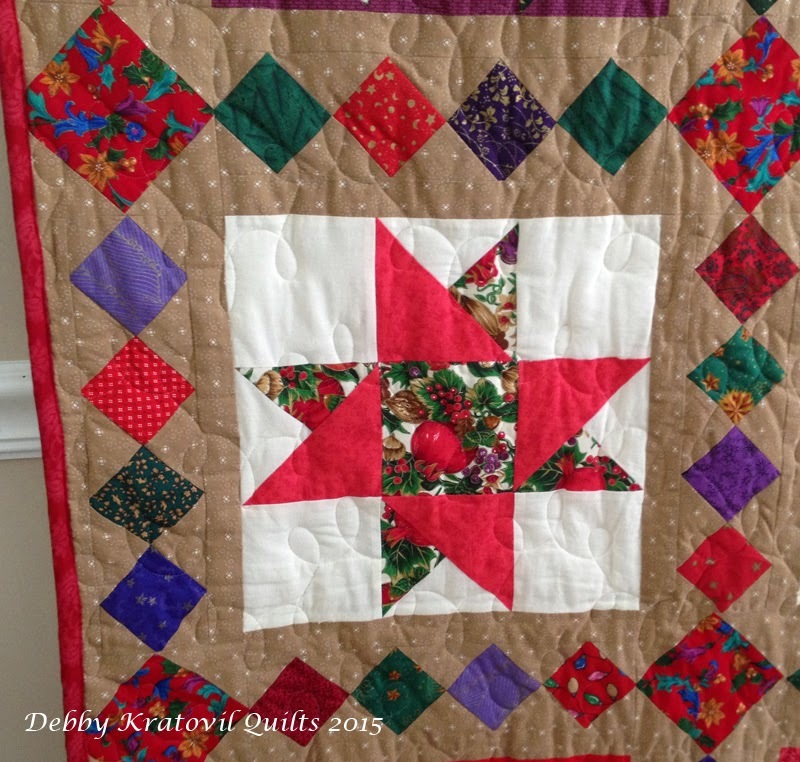 Thanks for joining my quilts today! When I got married in 1977 to my dearly beloved, it was a double wedding ring ceremony. Simple rings, simple ceremony. It was in Africa and a garden affair (actually someone's lovely back yard). 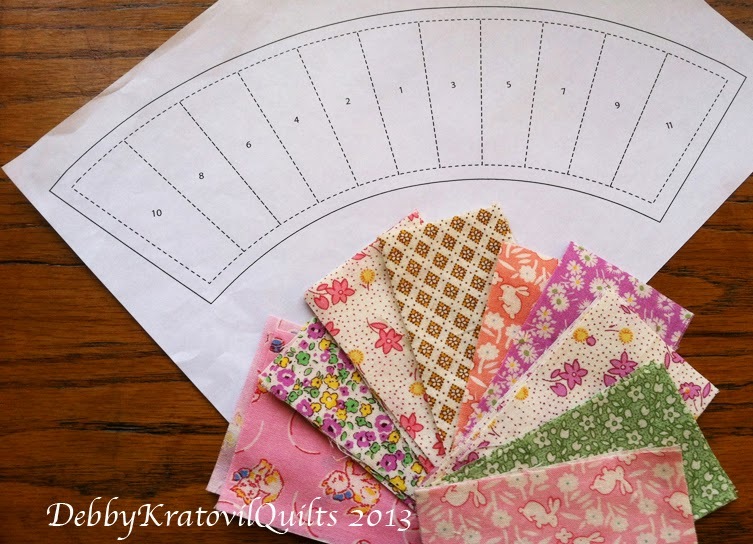 Most quilters imagine a Double Wedding Ring quilt to be daunting and I agree - unless you find some shortcuts. And I'm the queen of shortcuts! 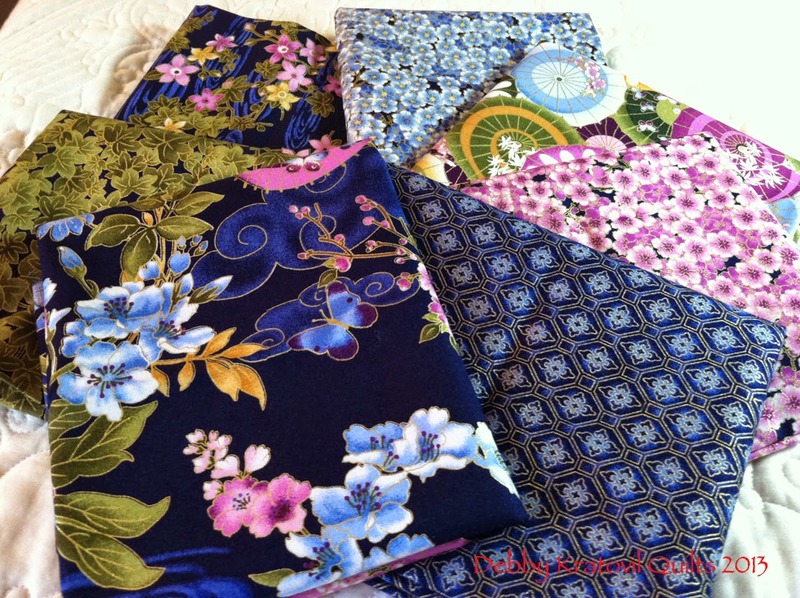 Two years ago I was sent a collection from Blank Fabrics called Mariko. 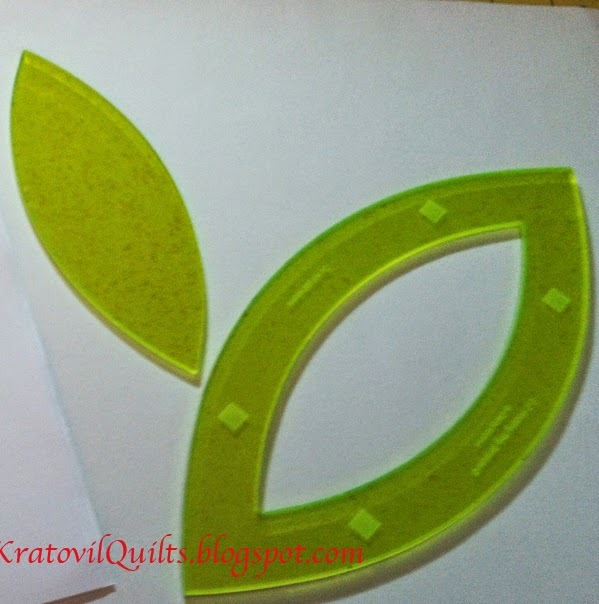 Then I began to sew these to the melon shapes, squares and concave background pieces. SLOW is the operative word, I assure you! Add a background unit to the first section with the melon attached. And what do you get? In looking at this picture again (photographed 2 years ago), I realized that I didn't like this arrangement! 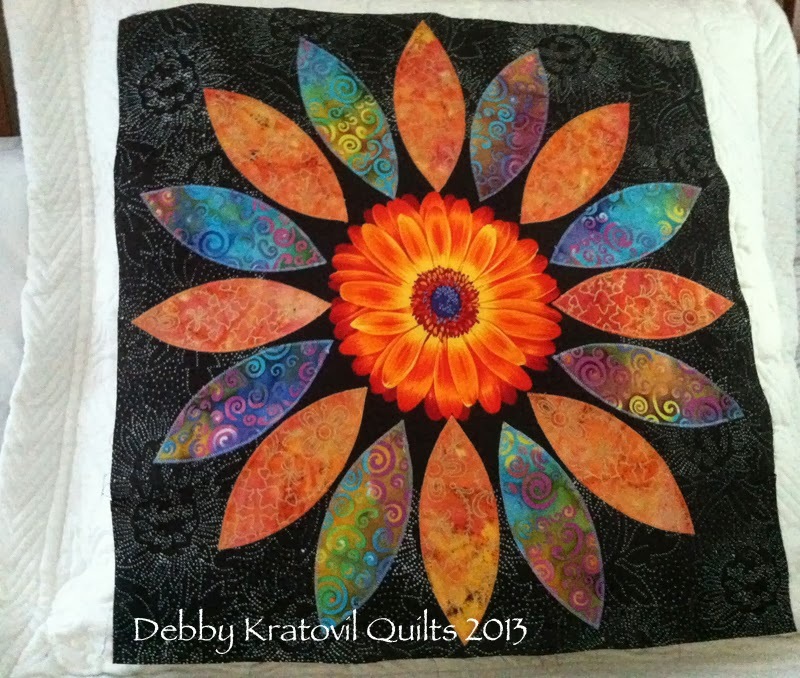 Can you see the difference between the picture right below and the finished quilt? 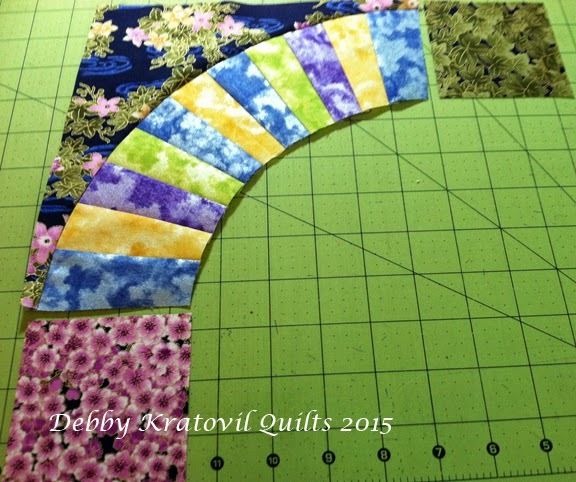 Yes - I decided to leave one of the curved paper pieced arcs without the floral background piece. 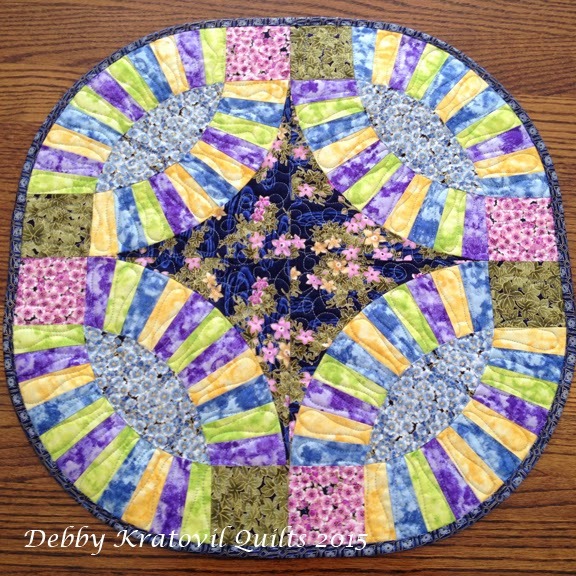 Repeat 3 more times and NOW we have the finished table topper (last picture). This is what happens when you abandon a project for 2 years! 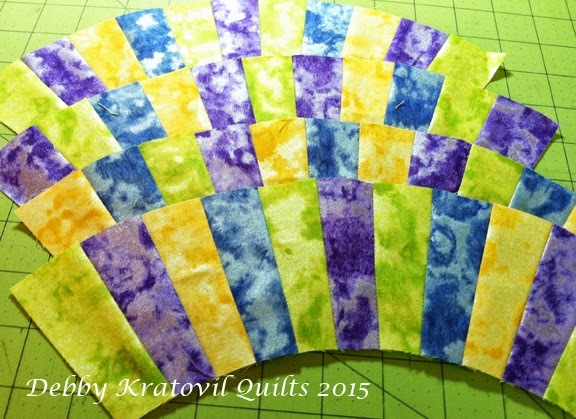 Now it was time to machine quilt my 4 units. 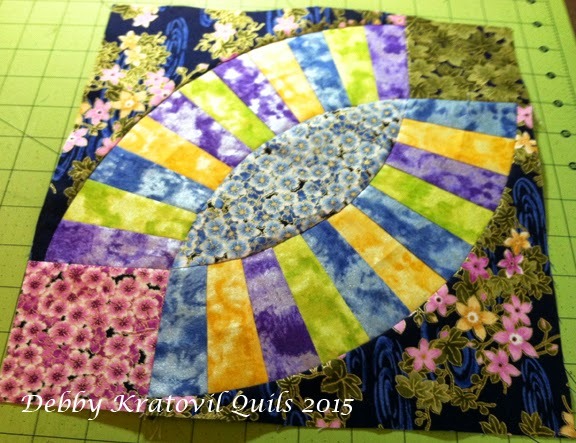 I have had fun using my new Handi Quilter Sweet 16 (sit down model) and this was a perfect size for that. 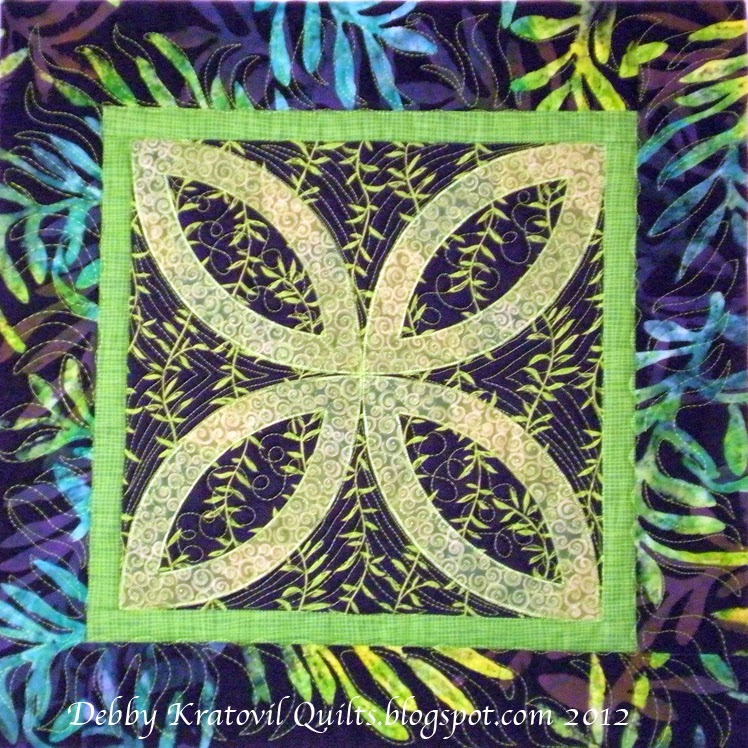 Again, when a fabric is a busy print, my belief is that you don't have to be fancy with your quilting. 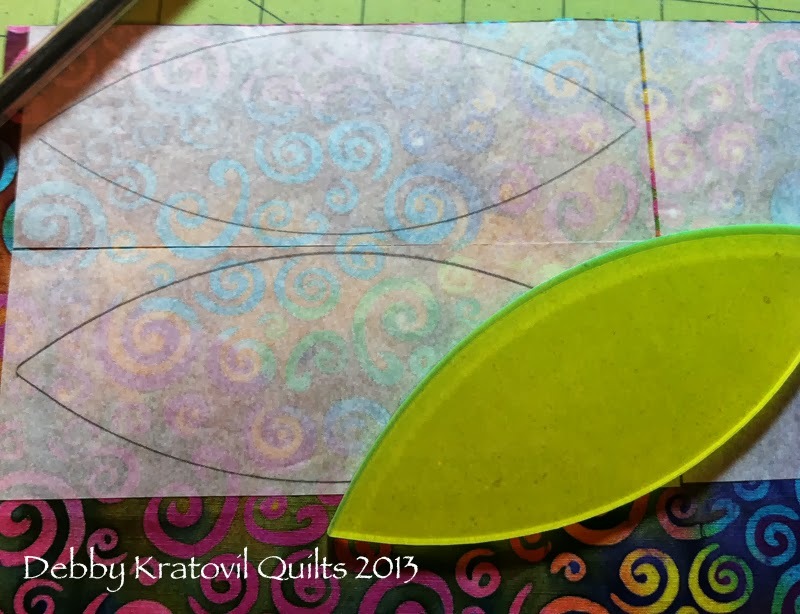 I used my loops in the center and then "echoed" the wedges in the DWR arcs using up and down swirls. I selected one thread that would work with all the colors. 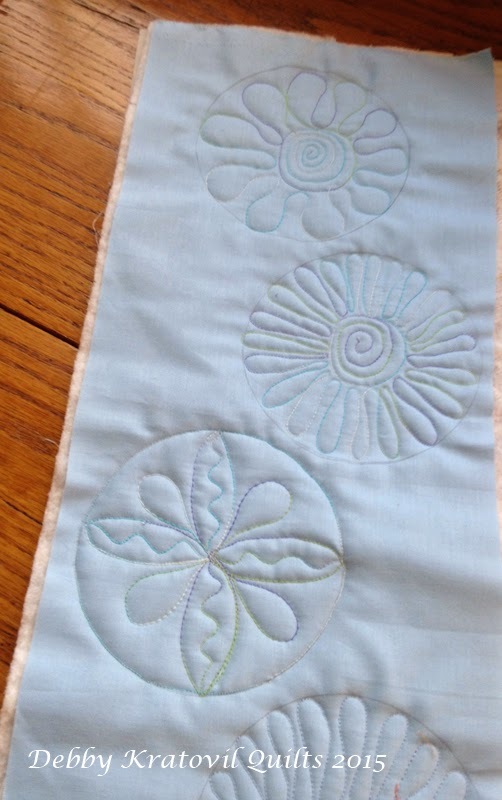 I have used bias binding only a handful of times in my 30 years of quilting. For this, I HAD TO use bias binding. Whew! I was sweating bullets, for sure. 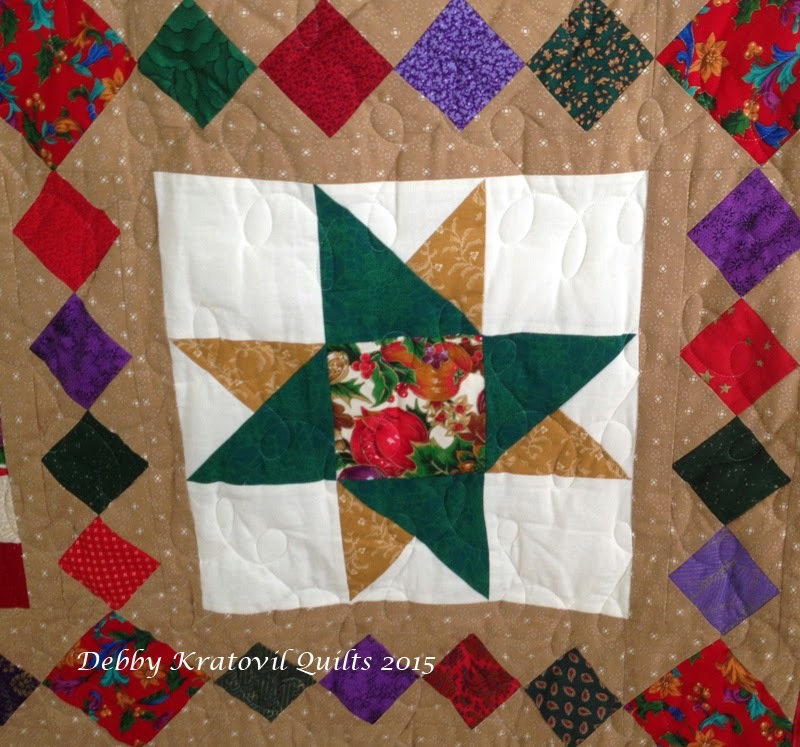 If you want constant inspiration of what a variety of Handi Quilter machines can do, visit their Facebook page to see daily pictures of some awesome work. And they're not "loopers" either (like me). See? It's not that overwhelming. Of course, I did not make a bed sized quilt. I just satisfied my desire to both work with those fabrics and to see how a DWR unit would look. 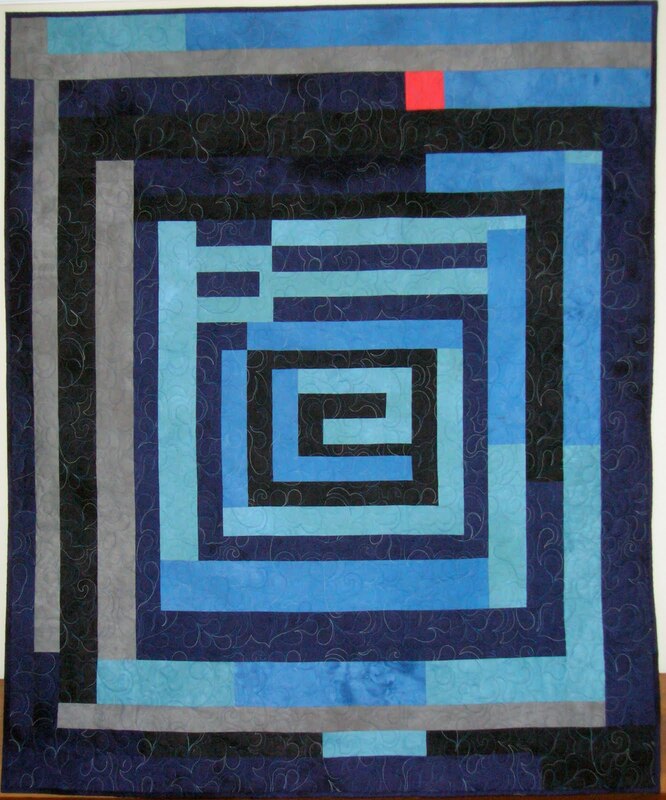 I know this is a big picture, but I wanted you to see the quilting on it. Amazing, isn't it? 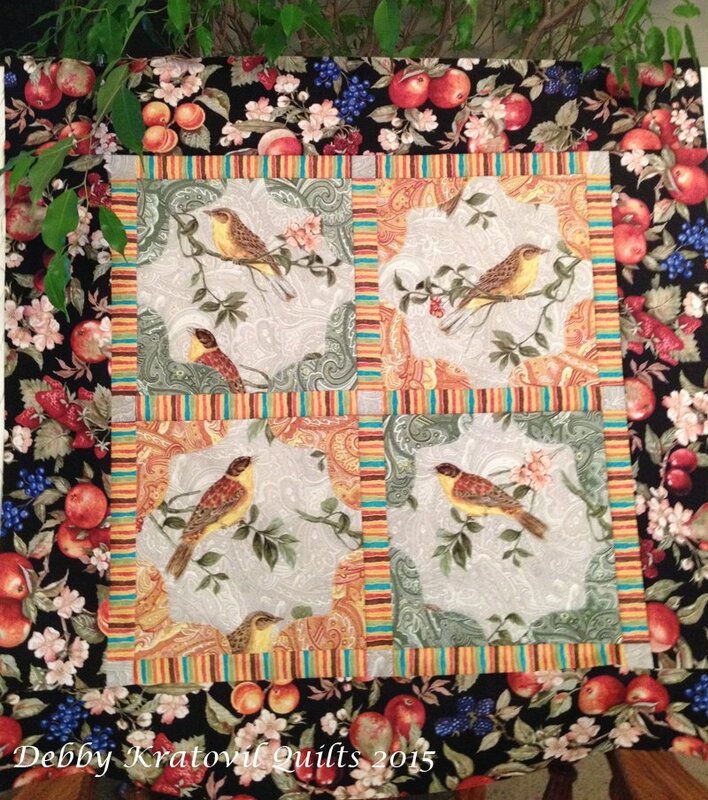 Michele Wyman of Acworth, GA quilted this for Susan Fisher, who made it. It appeared in my first book: Bold, Black and Beautiful Quilts. I called it SHOTGUN WEDDING RING because it was quick to make. Those melon shapes have a fused backing and are raw edge appliqued. 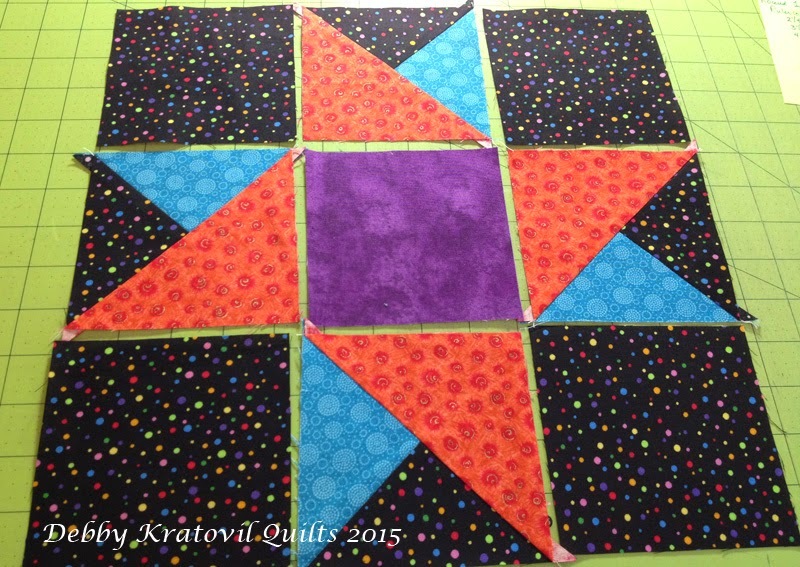 The blocks are 15" square. 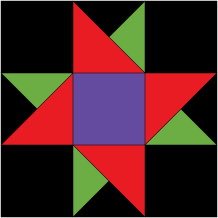 (This quilt has 12 blocks) The multi-page, well illustrated pattern ($5.00) also includes a full page line drawing so you can color in your fabric choices. OK, Debby. Where did you get the pattern? I confess: sometimes I like to work with someone else's pattern (like once every 5 years) and don't want to bother drafting my own. 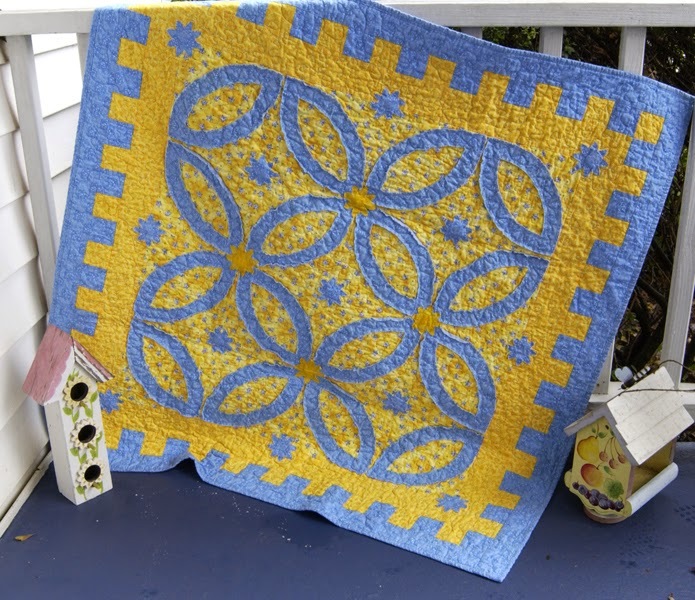 This is a FREE pattern from McCall's Quilting. I altered it for my own use, but the size and # of patches is the same. You will need to download TWO files. One is for the instructions (with the picture of the quilt) and the other is for the templates and foundation. 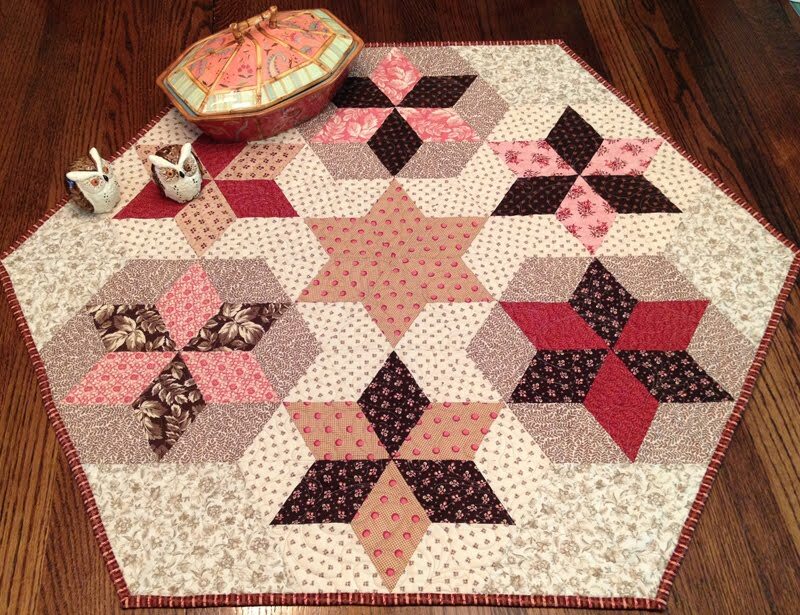 Vintage Double Wedding Ring Quilt is the page where you'll see a lovely picture of the quilt and shows both links. Here are a few of my units. I'll share more later this week. Stay tuned. I made some of these in some Asian prints. 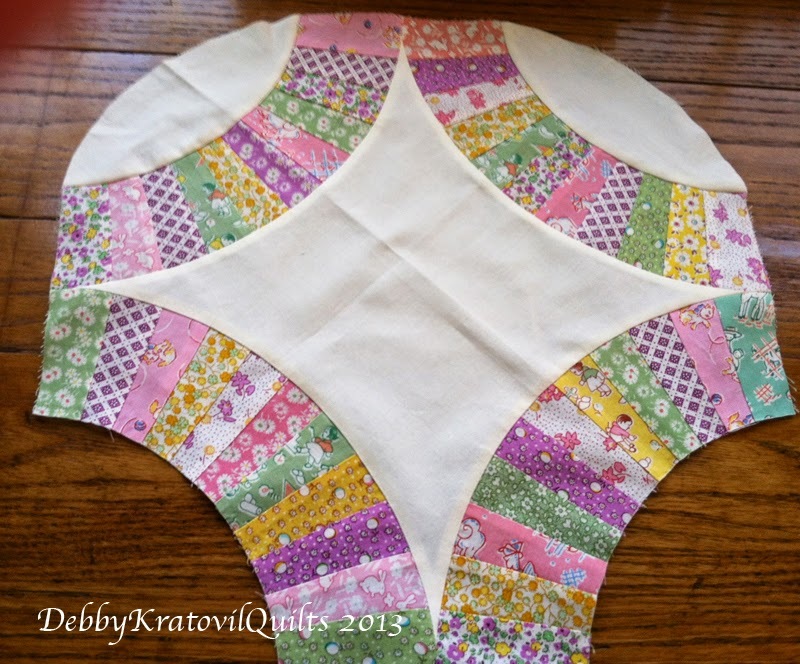 I also used some of the parts to make some interesting blocks (Patty's Summer Parasol). I'll take some more photos and share them. 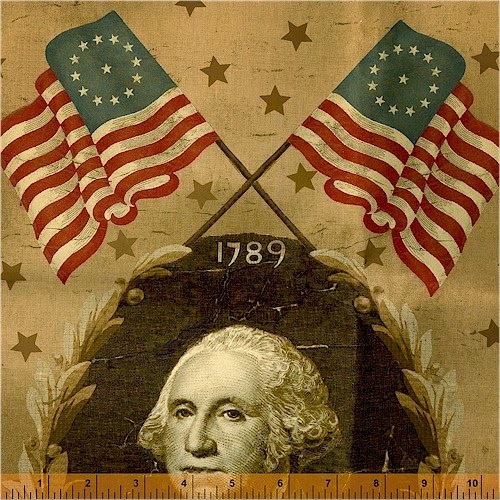 George Washington was the first American president, commander of the Continental Army, president of the Constitutional Convention, and an innovative farmer. His example of character and leadership continues to inform and inspire future generations. Last year at this time I featured a tribute to George by showing off some fabric with his face on it. Do you remember? Wow, George. What a large head you have. And flags for a headdress? I had some giveaways of these panels. I allowed myself to keep one of each. Not sure what I'll do with them, but hey - I don't have plans for much of my stash. 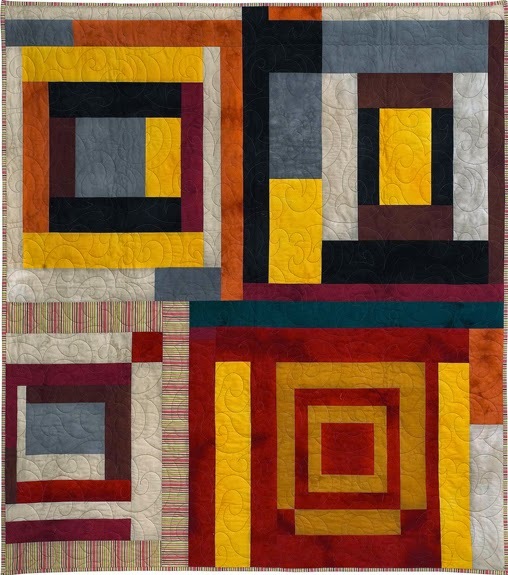 I love modern quilts and fabrics. I also love traditional fabrics and quilts and the reproductions. 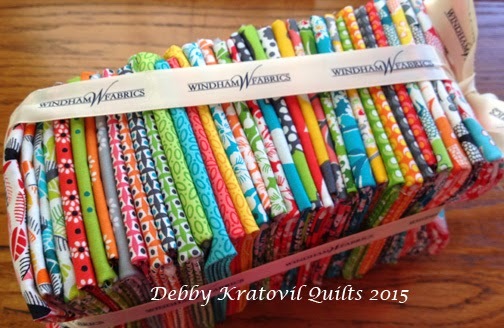 Windham Fabrics does an awesome job with these, don't they? Happy Birthday, George. Aren't you glad you're out of the wretched snow we have here in the DC area? Mt. Vernon got a lot of it and you had no snow plows back then! Stay warm, my friend. Red and White and Graphic! We are still in February and that means red. Red for Valentine's Day. Red for National Heart Month. Well, red is also the color of FABRIC, right? 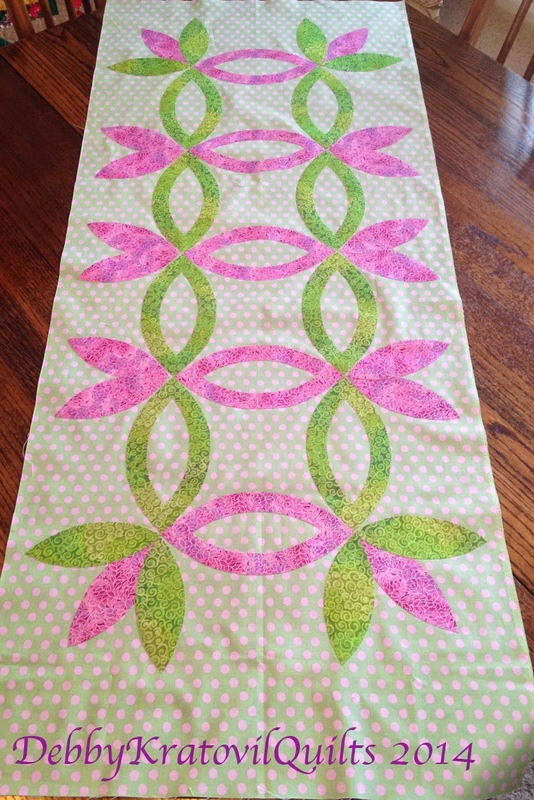 I have a newish pattern with Cut Loose Press that uses a specialty ruler by Creative Grids. I have named it Red Hot Logs. Do you want to see it? Of course, you say! 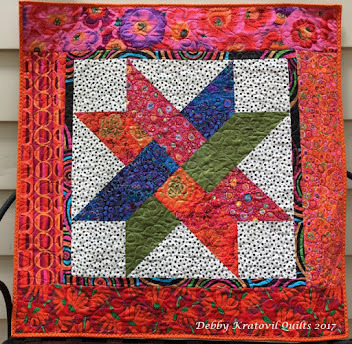 This is a quilting blog, for goodness sake. 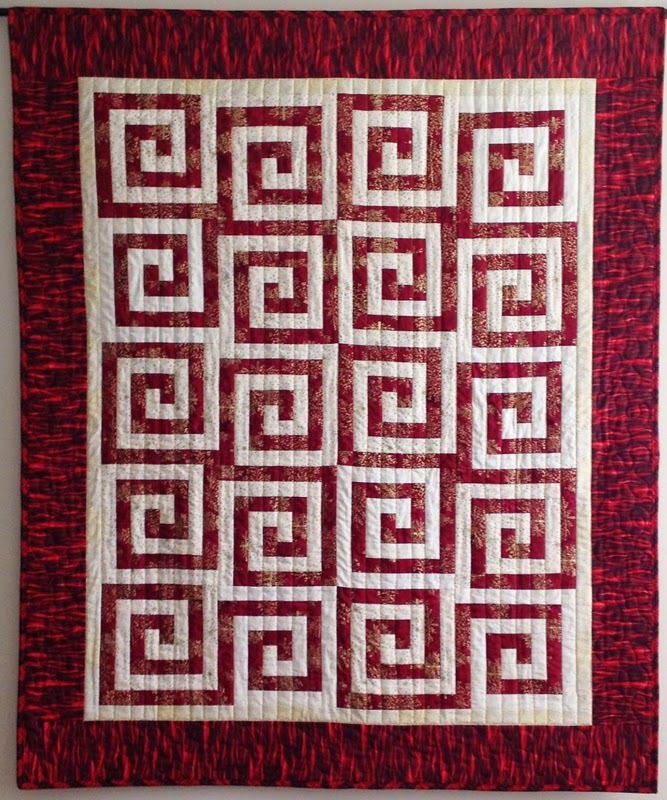 Red Hot Logs - 42" x 50"
I was using the 8" Log Cabin Trim Tool by Jean Ann Wright. Jean Ann was my senior editor at Quilt Magazine for 14 years (she was editor for 25 years). She published just about everything I created. I learned EARLY to sew for the camera. Contrast. Contrast. Contrast! I have a dozen I'd like to sell. Actually, 11, because I want to give one away. 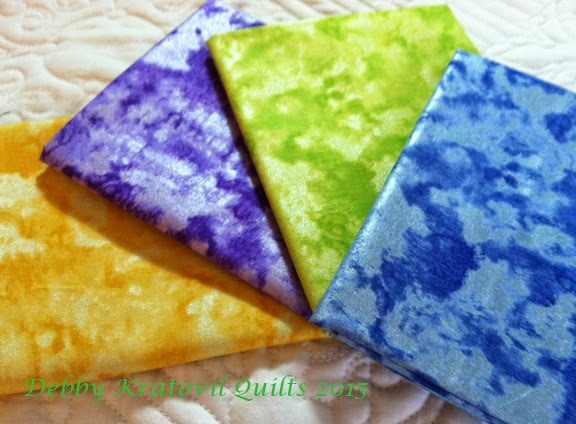 These are quilt shop ONLY patterns (or you can get them from the designer, ME). These are produced by Cut Loose Press (a division of Creative Grids Rulers) and you really need the 8" Log Cabin Trim Tool to make it (or you can figure out the dimensions by looking at the steps). This is a pattern that is condensed onto one 8.5" x 11" piece of card stock, front and back, in color. Illustrations and great directions. They retail for $3.95 - good price, huh? Leave a comment here and you could be entered to win a copy of the pattern (international folks are YES included). (Contest for giveaway is over Saturday February 21 at midnight). If you want to order one, send an email to me (kratovil@his.com) and you can pay through PayPal ($3.95 plus $1 postage). There are still 9 days left in RED February. That means ONE MORE WINDHAM WEDNESDAY FOR A GEE'S BEND PATTERN GIVEAWAY. Whew! So many capital letters - I need to take a break. OK. I'm back. Remember those red Benartex fabrics? And the letters I cut out? 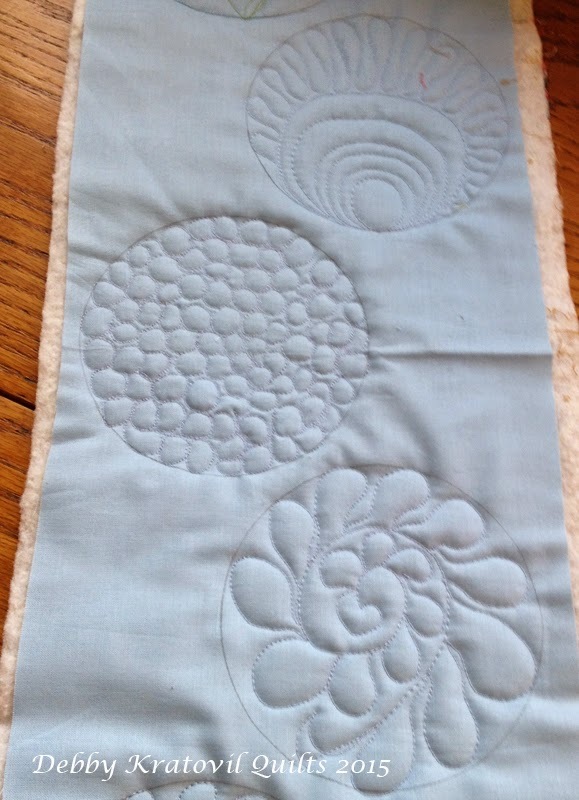 Maybe I'll show them appliqued to some blocks. Thanks for visiting today. Stay warm. Where I live we are in the DEEP freeze! 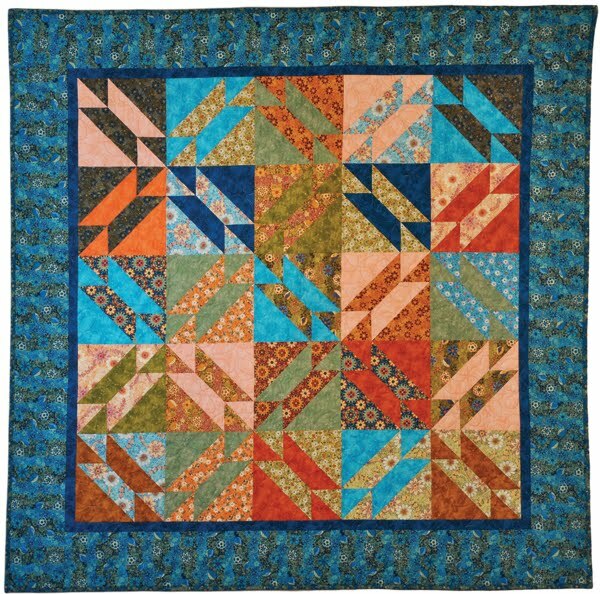 Winner of last week's Gee's Bend pattern giveaway was Gill W. of the U. K. She chose the Housetop 4 Block quilt. Congratulations, Gill. Leave a comment at the end of today's post for another pattern giveaway. 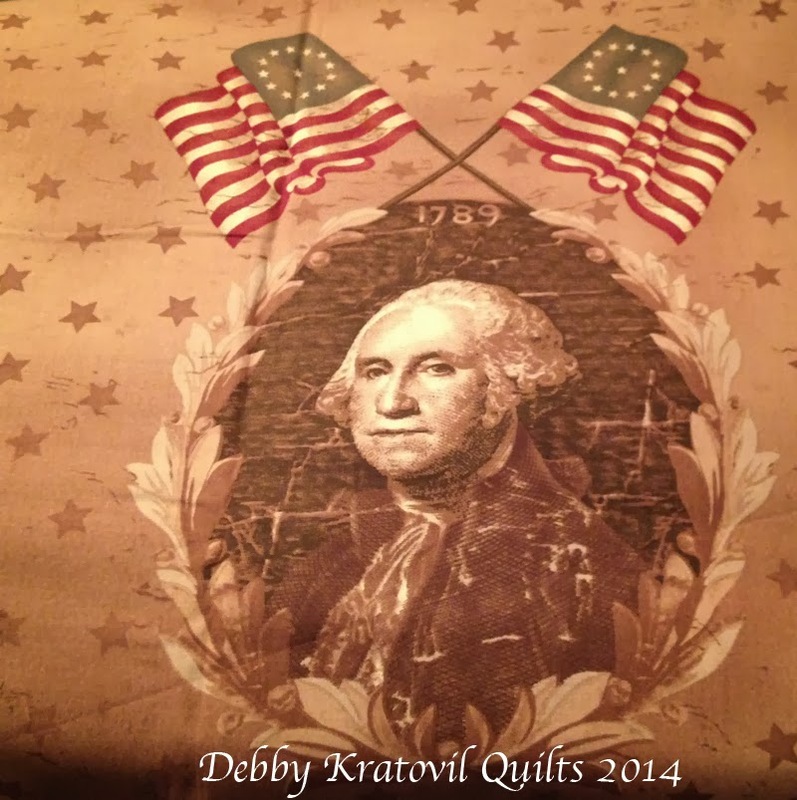 Check out my Craftsy site to see all 8 of the patterns. If you win, you can have whichever one you want. Contest is over tonight at midnight (February 18, 2015). This week's winner is Beth A. of Washington (state). Congratulations, Beth!! 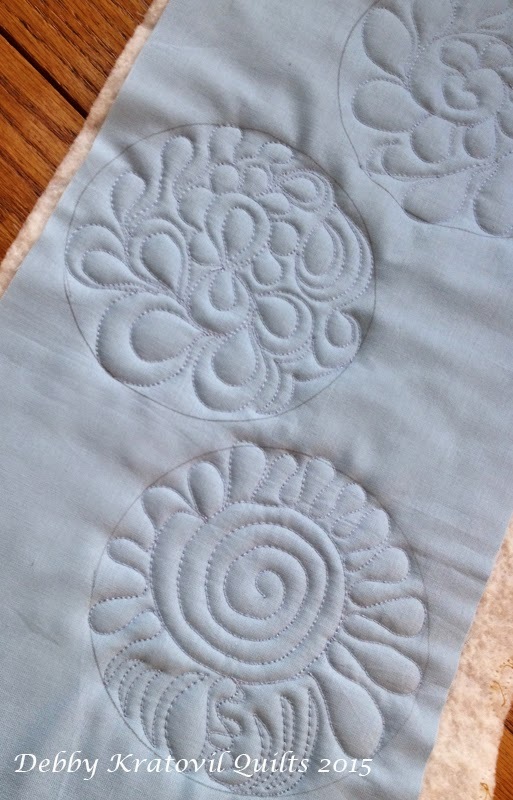 This post has two parts: first my own improvisational quilting on a small version of a Gee's Bend quilt of my own making. The second is some samples for my upcoming classes. My oldest daughter has an awesome friend named Meg. They have been buddies since graduate school. 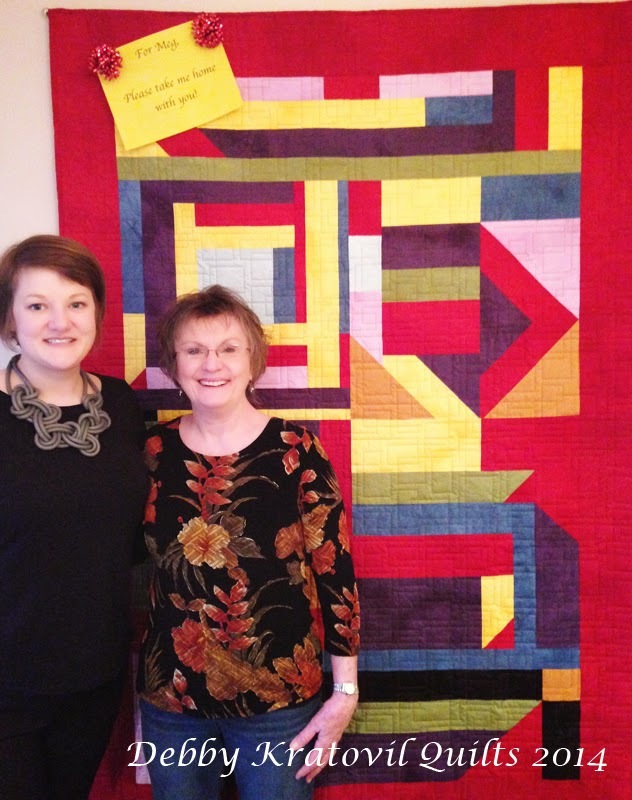 I gave Meg her own Medallion Variation quilt last year. She saw the quilt top at my house and was awestruck. I listened to the voices in my head and got it quilted and gave it to her. I was a little tricky in my gifting: I hung it in my kitchen with a BIG sign on it to "Take me home, Meg." I invited her to dinner with Audrey and husband. It took Meg 15 minutes to get the message! I had a little sample from a previous class and I thought: Hmmmm. 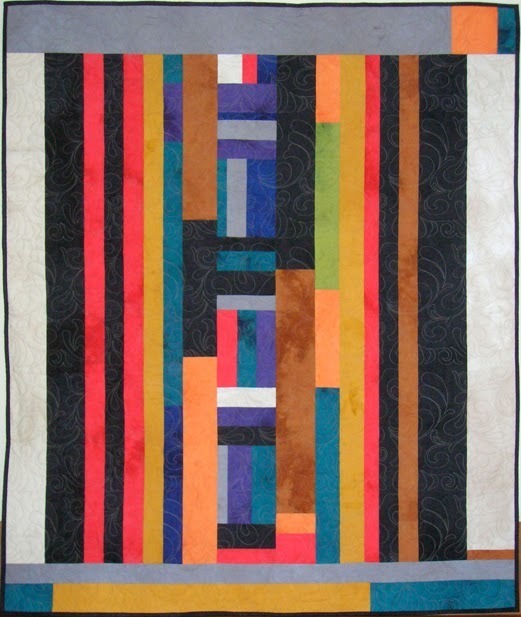 I think Meg might like another one of these Gee's Bend quilts. Maybe if I quilt it quickly and bind it even quicker, I can give it to her on her birthday (January). I did it and she was equally as excited as she was when I gave her the Medallion Variation. Meg took pictures and sent them to me. Would you like to see them? Of course, you say. Without the oranges . . .
Don't you love those rich colors? Did I tell you that Meg is an awesome person? A perfect friend for my oldest daughter Audrey. 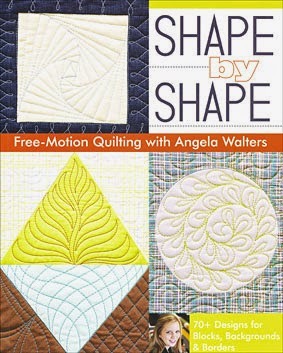 I bought a new book by Angela Walters, Shape by Shape. 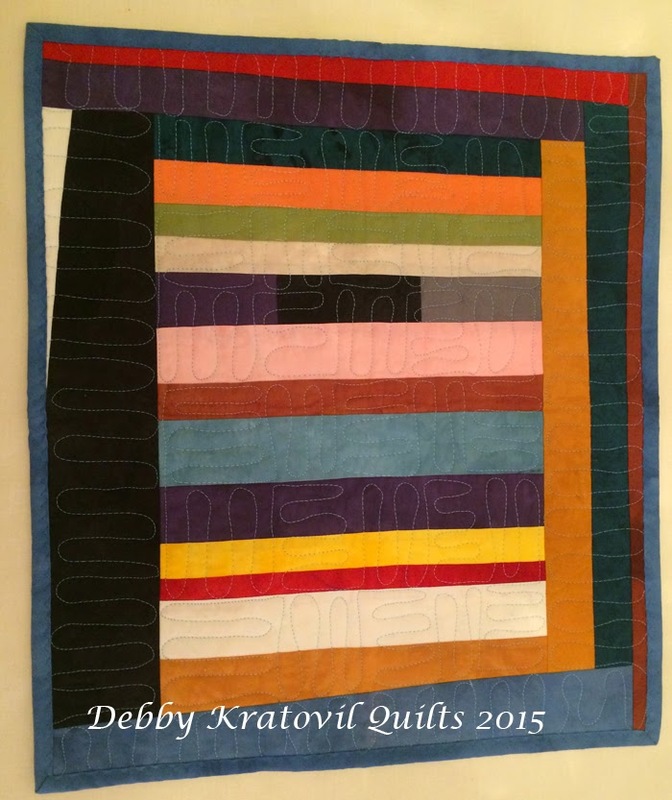 I teach BEGINNING free motion quilting for the Original Sewing and Quilt Expo and I'm getting ready for the Lakeland, Florida show March 5-7. 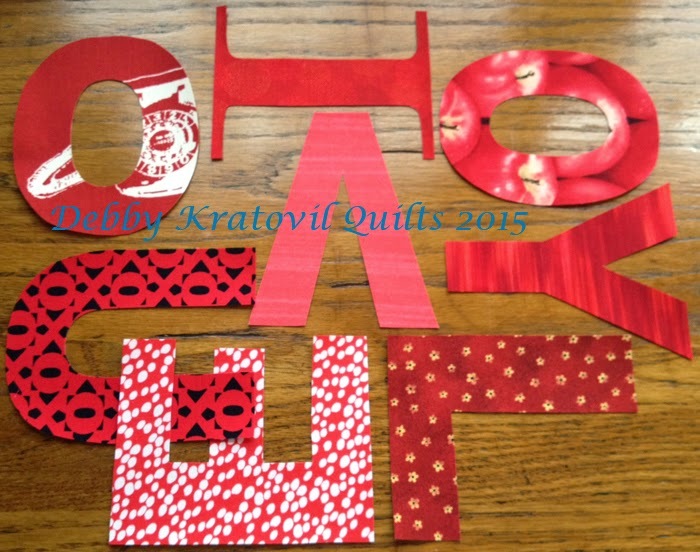 I will be in the HandiQuilter Sweet 16 classroom and I decided to make a few new samples. I will recommend this book HIGHLY to my students. I don't copy and share her work; just suggest it and show my own poor versions of her ideas. What's the matter, Debby? Aren't your old samples good enough? Of course, they are. But I have always been the sample QUEEN! I have 7 years of samples and I'm always thinking of something new. Can I show you what I did yesterday? This fabric is light blue, but you would never know it! Pebbles. I HATE pebbles. I have to tell the truth. Hello? I hate pebbles, but my students always want to know how to make them. They are so labor intensive. See the circle at the top left? That is my OWN, GO TO pattern. No name. Just comes off my hands when I get under a needle with the feed dogs down. I actually can get smooth curves and a semblance of order. I traced circles using (wait for it) - a CD ROM disc. Perfect circle to work with. The diameter is 4.75". Good enough for a lot of things. OK. I'm tired. I shoveled snow for over an hour today and I think you've got to be weary looking at all these images. Leave a message or comment to enter my giveaway for the Gee's Bend pattern. Yes, I know this is Friday the 13th. Shhh! I'm not going to talk about THAT, but instead focus on red letters. 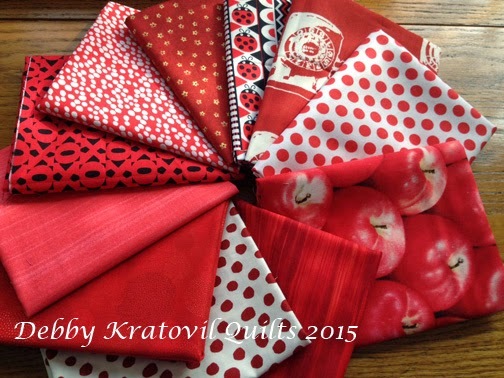 Remember that group of luscious red fabrics from Benartex? Well, I cut out some letters, but they got all mixed up! Can you help me untangle them? I think there's a message there but I somehow forgot what it was! Yikes!! I'm not sure if tomorrow being Valentine's Day has anything to do with it. But I will be working on these next week. Red is the color of February (remember this is National Heart Month), so there's no hurry. I'll keep you posted. But if you have any clue as to what message these letters might spell, let me know! 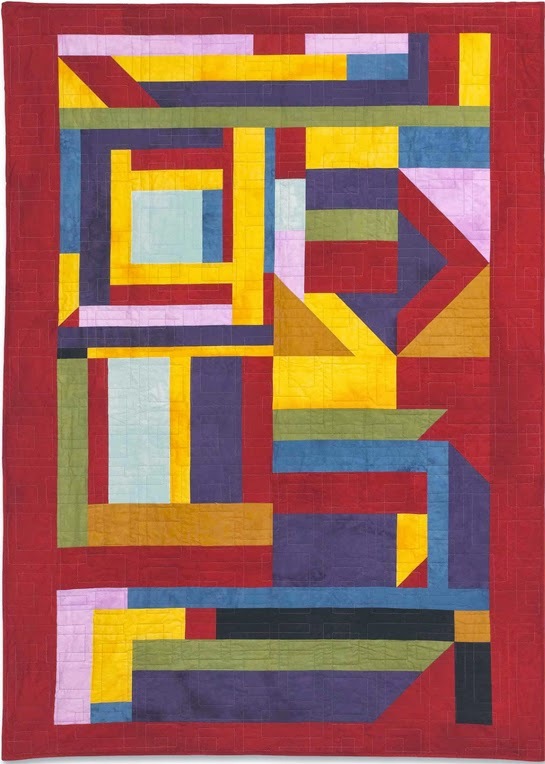 This is Black History Month and in a respectful nod to the Gee's Bend quilters, I am offering up a free pattern (any one of eight) to one lucky winner today. Then again next Wednesday; and the next; and the last Wednesday of February. That's 4 lucky winners! My winner from February 4 is Anja of Canada. She chose the Medallion Variation. Lazy Gal Quilt: 52" x 62"
You can see all 8 of them here at my Craftsy site. The contest is over at midnight TONIGHT. 24 hour contest. Just leave a comment about anything on this blog. Make sure I have your email. Let me show you what's coming up next Wednesday with Windham. I received the new Mimosa Collection on Friday and sewed up a storm all weekend making a . . . (you'll have to come back next Wednesday.) 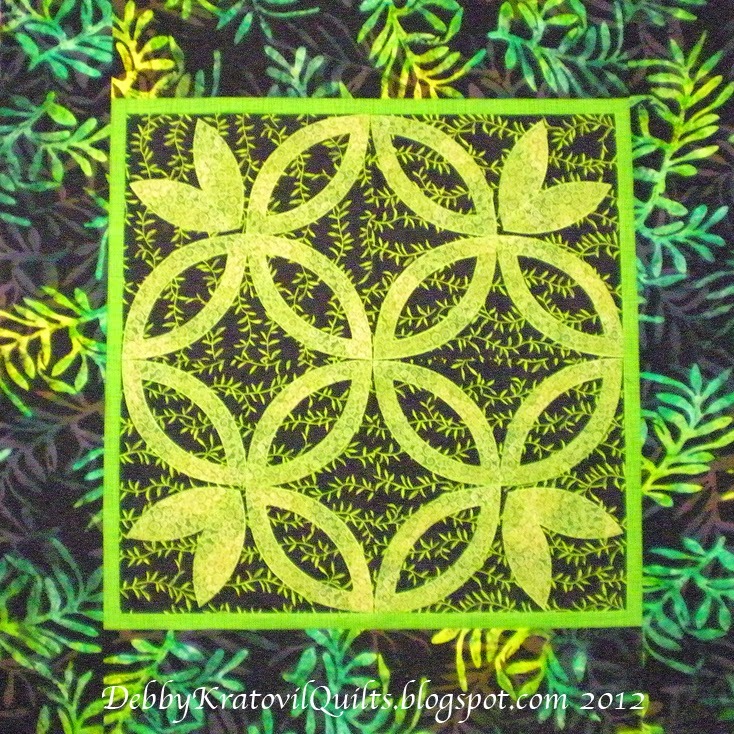 I will be showing all the wonderful blocks I made and sharing another free pattern! And here's a wonderful view of all the prints. I could just sew with these for days and days! If you want to be considered for ANY of the Gee's Bend patterns, leave a comment. If you don't win this week, you have three more chances in February! It's February 1 and that means I've added the second block in this series. It is called Air Castle and is a traditional block. Don't you just love those spinning points? 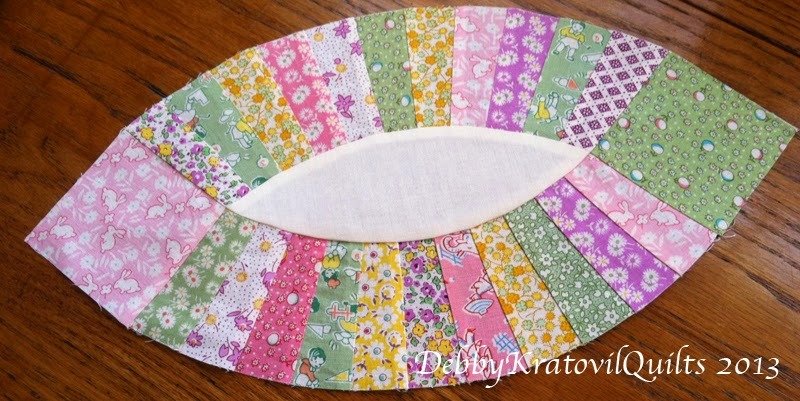 This month is easy rotary cutting and sewing. 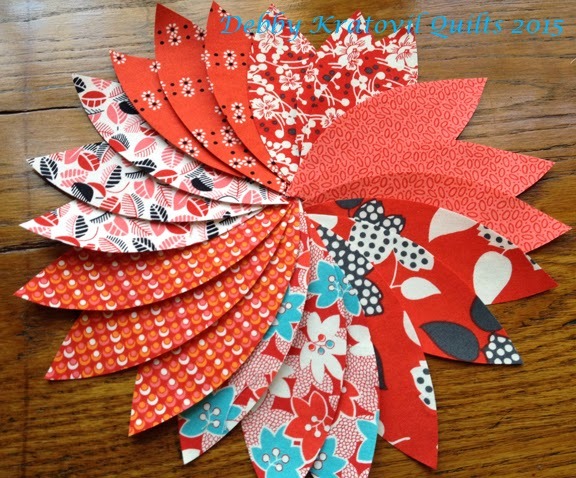 I offer a one page pdf with simple diagrams for cutting and piecing. I hope you are enjoying the process! I noticed I had TWO Air Castle blocks in my large Christmas quilt (made about 20 years ago). I have stared at this for almost 2 months every night when I eat dinner in the dining room (much warmer than my stone cold kitchen). My husband asked me the other night what I was fixated on. I said, "Wow. 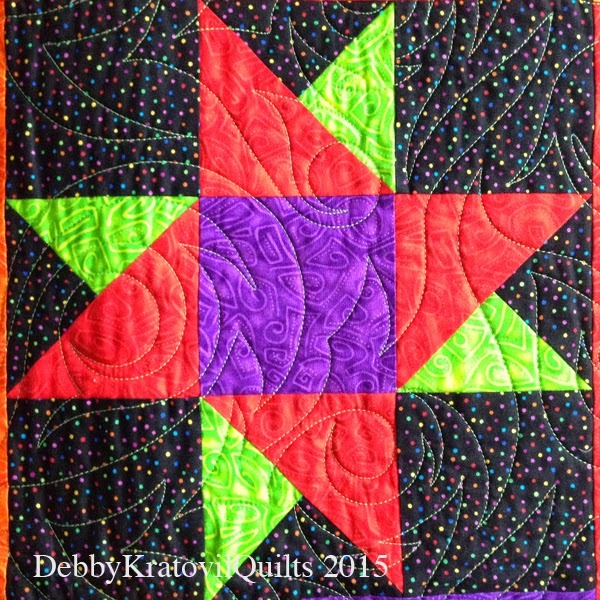 I have two of the same block in that quilt and they are block #2 in my Galaxy of Stars BOM." Did he know what I was talking about? Are you kidding. "Yes, dear." 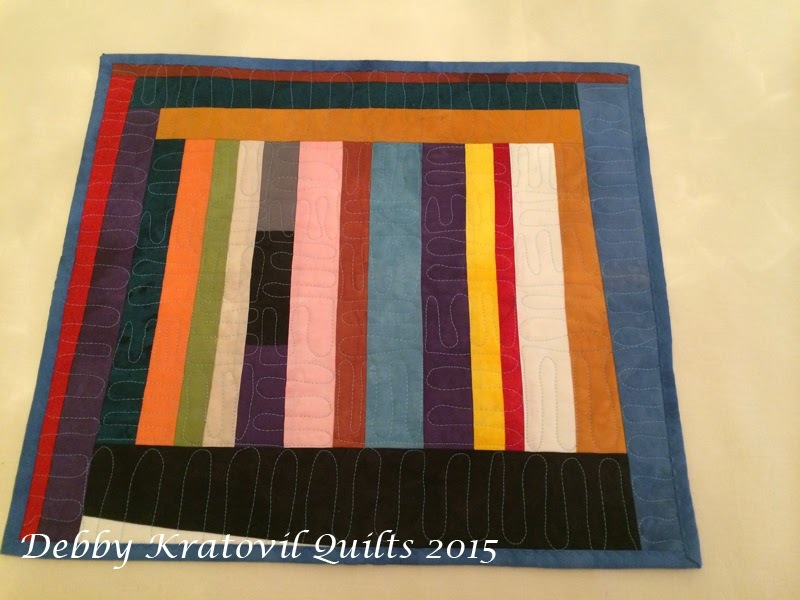 The quilt has 20 blocks, 12" square. It hangs on a large wall. Someday I'll snap a picture of it, though it was published about 20 years ago. It was a swap on America Online (yes it was).